Do you have a new high-quality paint booth, but still find dust and dirt in your paint applications? Paint Booth maintenance may be your solution. There may be something wrong with your automotive paint booth, however often times simple maintenance may resolve any or all issues. Most often, the reason for a contaminated paint job is a dirty or poorly maintained booth. Proper cleanup and maintenance is crucial for creating flawless finishes, and also provides a safe and efficient working environment for your painters. We have compiled a list of maintenance tips that generally apply to most types of paint booths, but it’s crucial that you check your specific paint booth manual for maintenance recommendations outlined by the manufacturer of your booth to ensure that you’re following their guidelines for best results. The simplest and most important way to prevent dust from entering your booth is to keep all booth doors closed. When you must open the doors to enter the booth or drive your vehicle into for spraying, be sure that the booth is on and running in order to draw all airborne contaminants into the exhaust filters. Don’t leave any unnecessary items in the booth. Caulk ceiling frames, wall joints, fire sprinkler openings and compressed air pipe openings. Seal entrance and exit doors, access doors and concrete floors. Limit traffic in and out of booth. Never spray without lint-free painter’s suit and head cover. Store painter’s suit in a clean area. Properly prep the object you’re painting prior to it entering the booth. When it comes to filters for your booth, you definitely get what you pay for. By purchasing a cheaper filter to save money, you may actually be costing yourself money. High-quality air filters provide high efficiency and the correct diffusion to prevent inconsistent airflow and turbulence. Your best bet is to use the filters recommended by the manufacturer of your paint booth. It’s also important to routinely replace the filters. A plugged will throw off the balance of your paint booth and and allows buildup of overspray on some exhaust fans. Regardless of how well your booth is engineered, eventually some overspray could collect on your spray booth walls, floor and other surfaces. This overspray or any dust in the booth can become airborne and become present on your paint job. Prevent this from happening by cleaning all booth surfaces regularly. Overspray also collects on items found within your paint booth cabin. Take a good look at the paint gun and air hose. This caked-on paint can flake off and end up on the painted surface. Over time, air hoses may also begin to flake on the inside. Make sure to regularly clean air hoses and paint guns, and replace when necessary to ensure a dust-free automotive finish. Your paint booth exhaust can also fall victim to contamination. Old paint deposits can build up in the exhaust plenum, duct and fan, reducing the operating efficiency of the booth. You should at least inspect the entire exhaust system to check for potential problems before they can occur when you are cleaning your paint booth. Dust, dirt and paint overspray may be obvious choices when it comes to maintaining a clean booth and properly operating equipment. However, moisture can also be a culprit when it comes to paint application contamination sources. Spray guns, gun washers and the spray booth itself all require compressed air. Unfortunately, compressed air systems produce moisture. Moisture condenses and can cause damage to tools and imperfections in your paint job. There are many alternatives out there for reducing and eliminating moisture in your compressed air system, including refrigerant dryers. Make sure you choose a system that performs well and is reliable and make sure that it is maintained regularly to ensure optimum results. Protective clothing for your painters plays a simple but important role in both quality and safety. All technicians should wear a clean paint suit that covers the entire body, from their hands to their feet. Not only does this keep dirt out of the paint job, it also protects the painter from exposure to harmful chemicals that can be found in coatings such as paints and varnishes. 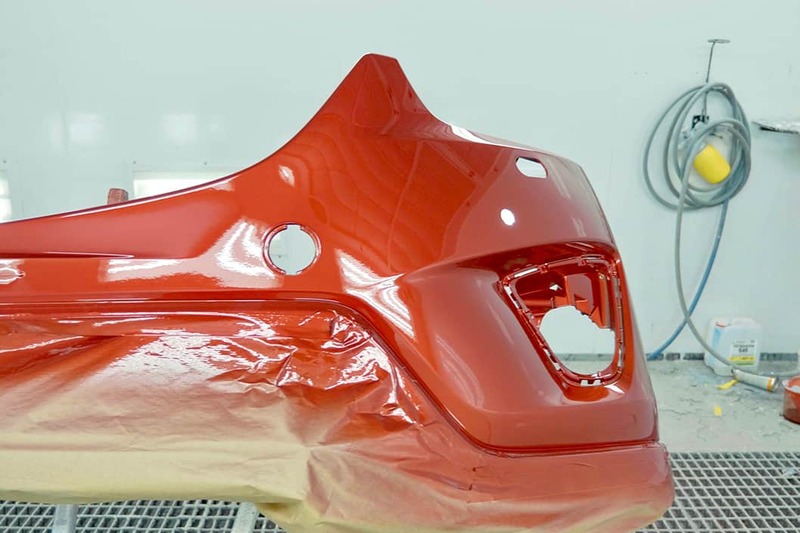 Our team of professionals can assist you when it comes to choosing the right paint booth for your automotive needs. We offer a full line of USI North America paint booths. Give us a call today for more information at 800.604.9653, Monday through Friday 8am to 5pm.